If this is Trump’s strategy, those who jeered Homeland Security Secretary Kirstjen Nielsen at a Mexican restaurant or protested at her home have been playing their part effectively. They apparently believe that intensity of conviction is demonstrated by incivility, just as Robert De Niro seems to think that conviction is proven by crudity. This is childish but not harmless. It is one more step in the personalization of political anger. One more method to turn fellow citizens into bitter enemies. But Nielsen gets it from all sides. She is not just harassed during meals and family time, but during the working day. At a May cabinet meeting, Trump berated her for half an hour about the pace of illegal border crossings, causing other cabinet members, by one account, to start “fidgeting in their seats and flashing grimaces.” Nielsen, according to some sources, momentarily thought about resigning. Sometimes your first thought is the best one. Though Nielsen was described as uncomfortable with the policy of family separation, she displayed her loyalty by becoming its public face. She denied it was intended as a deterrent — “Why would I ever create a policy that purposely does that?” — as other senior administration officials were affirming its usefulness as a deterrent. She declared, “We will not apologize for doing our job,” just before Trump backed down and abandoned the job she was doing. A public servant who probably would not have supported child separation in another administration is now permanently identified with this act of shocking state-sponsored cruelty. This is Trump’s leadership legacy: Because he continues to push the boundaries of decency in rhetoric and action, those around him must prove their dedication by parting with their integrity and moral judgment. The least reluctance is taken as betrayal. For some — the Stephen Millers and Corey Lewandowskis of this world — this is not a problem. They authentically cheer every step down the road of dehumanization. But most people who serve the president are probably in Nielsen’s category. To remain part of Trump’s team, they must defend the indefensible. They must struggle against conscience to do their job. This is an explanation, not an excuse. Enthusiastic or reluctant, the result of complicity is the same. Trump said, in effect: Prove your loyalty by endorsing cruelty toward migrant children. Nielsen willingly stepped across that line. The ultimate cause of this situation, however, is Trump himself. His followers are not asked to follow the contours of an ideology. They are asked to fully embrace his impulses and instincts. Those instincts move in a clear direction: toward feeding racial and ethnic divisions, salting national wounds, undermining rival institutions and violating restrictive precedents. But the unifying principle is Trump himself. G.K. Chesterton argued that the egotist is the exact opposite of the dogmatist. The dogmatist believes there is an objective truth that he wants everyone to see. The egotist believes that all his views are interesting because they are related to him. A dogmatist can be followed by accepting the same creed. An egotist is only served by showing subservience to his commands and enthusiasm for his enthusiasms. This results in a certain style of leadership. Trump has risen by debasing others. He builds his reputation on the ruins of other reputations. It is not enough for Attorney General Jeff Sessions to be criticized; he must be humiliated. It is not enough for former Secretary of State Rex Tillerson to be fired, he must first be drained of all dignity. The same dynamic can be discerned among Trump’s political followers. He has asked them to cross line after moral line — to accept a racially charged conspiracy theory about Barack Obama’s origins, to accept the demonization of Mexican migrants, to accept systematic prejudice against people of the Islamic faith, to accept that there were “fine people” among the white supremacists in Charlottesville, to accept the punishment of Hispanic children for the transgressions of their parents. Now Trump makes a further demand: to endorse the suspension of due process in the vicinity of the U.S. border. Who, he dares, will follow him there? Another test of loyalty that is really a test of character. 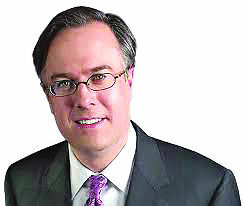 Michael Gerson is a columnist for the Washington Post Writers Group. He is cohosting a new, limited- run PBS interview program “In Principle” that runs Fridays at 7:30 p.m. CST. His email address is michaelgerson@washpost.com.